The first content pack is scheduled to launch this summer, and will include the addition of a Cave of Trials challenge, a new hard mode and a new feature for the in-game map. The second content pack will launch in Holiday 2017, and adds new challenges that will let players enjoy a new dungeon and a new original story. Given all of this news, are you excited for the new DLC coming to the game? Do you think it will detract from the experience, or only add to it? Be sure to leave us your thoughts in the comments below! 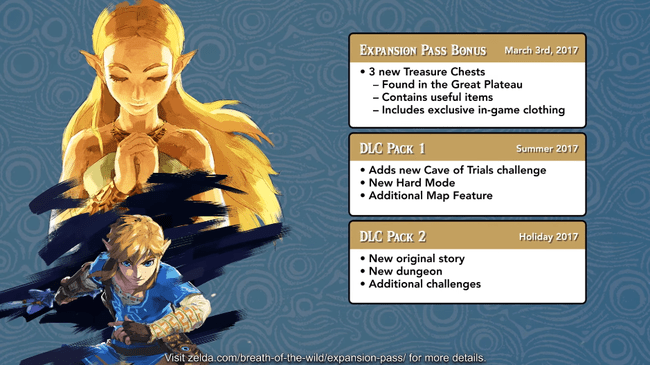 The Legend of Zelda: Breath of the Wild will be available on the Wii U and the Switch on March 3, 2017.